Your IT infrastructure has become business-critical. If an application fails or is slow, users will not be able to do their tasks. Loss of productivity, revenue and reputation are all direct consequences of poor IT performance. Unified IT service management is no longer an option, it's a requirement for cost-effective operations. 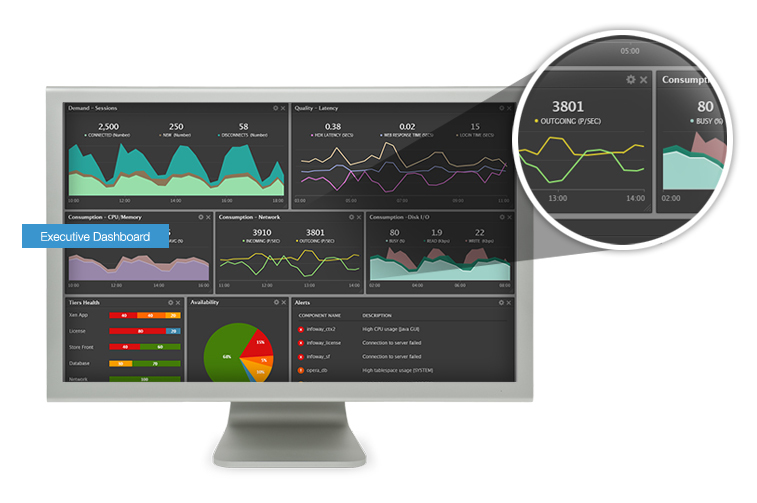 eG Enterprise’s customizable dashboards give you a powerful way to see the metrics that matter most to you. You can see the quality of service you are providing to users, understand where bottlenecks are, and track service demand and resource consumptions. With content-sensitive drilldowns, you will always know the answer to "why". eG Enterprise is used by businesses across the globe to transform IT service delivery into a competitive advantage and a center for productivity, growth and profit. Many of the world's largest businesses use eG Enterprise Universal Insight technology to enhance IT service performance, increase operational efficiency and ensure IT effectiveness. Keep users satisfied and productive. Reduce costs by right-sizing your infrastructure, maximizing resource utilization and reducing unnecessary hardware & software. Improve the ROI of your IT investments by driving better performance and efficient operation. Eliminate downtime through proactive monitoring and fast root-cause diagnosis. White Paper What should your key considerations for a monitoring tool be?